Betterment is a tool that is supposed to help do-it-yourself beginner investors. They say they save you a lot of time and you can get started investing even if you have a small amount to invest. This firm does actually manage your money for you but let’s take a look at my Betterment review to see if this new investment company makes the grade. My beef with robo investors is that they miss the big issue facing investors – including beginners. What is the big issue? Financial Planning. The plan is the big differentiator and dwarfs investment choices in my experience. And by completely ignoring that (because there is such little profit in it) it does you a disservice. Granted I am a planner and I am not objective. But this is my core belief and one you deserve to hear. At the same time, others have a very different take on Betterment. Having said all that, lots of Pilgrims ask me about Betterment – so here you go…. 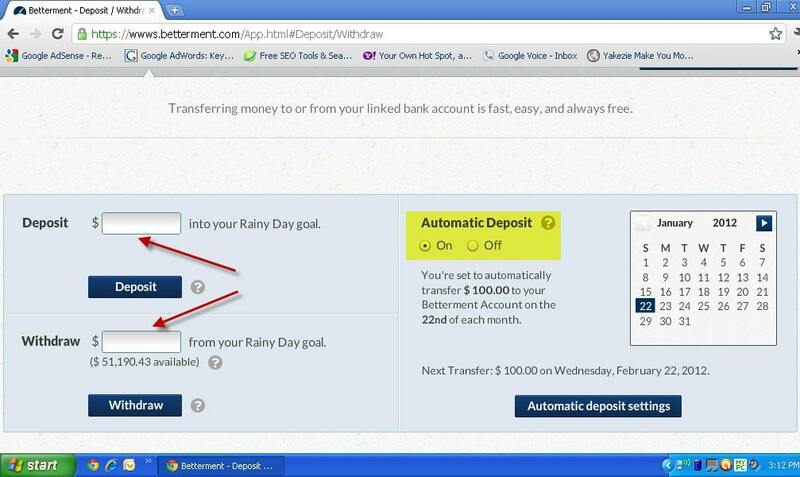 Register over at the site and open a Betterment investment account . Tell Betterment who you are, what your investment goals are and how much risk you are comfortable taking. Then you set the asset allocation. Link a checking account to your Betterment account so you can move money between your investment account at Betterment and your checking account. Then move money into your Betterment Account to get started. Done. Your investments are made for you and the account is rebalanced as needed. You can see the home page below. It’s a summary that provides a great deal of information. The summary shows what your current balance is, how much you’ve earned and how your account is allocated. The next screen (withdrawals / deposits) shows you if you have enabled automatic deposits and if so how much. It also allows you to make one-off investments or withdrawals. This is really easy, simple and fast. 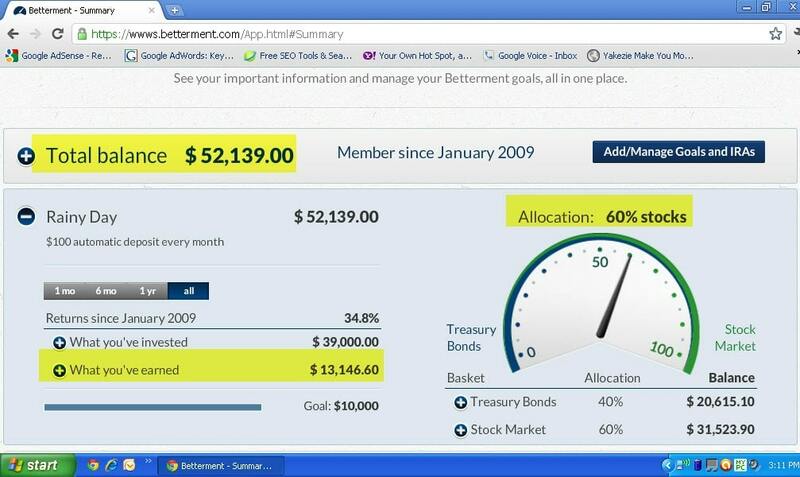 A nice way to automate your investing and one of the major benefits of using Betterment . The allocation tab is really a snap too. 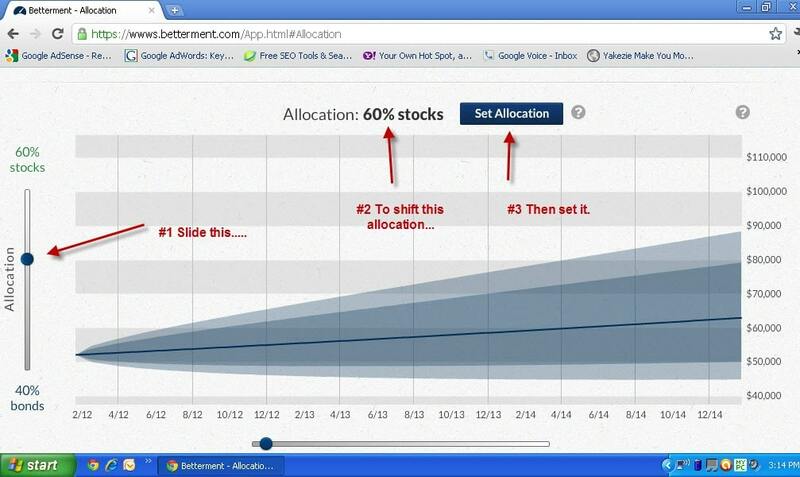 You simply slide the allocation dot to set your asset mix. On the far right, the graph indicates what your performance might be and how much money you might have down the line. This is a nice way to see what the impact of your allocation might be. The next nice feature is the Advice tab. Here you’ll set up your various financial goals and Betterment will tell you how much you need to save each month in order to achieve them. Sweet. This can be helpful for beginning investors with limited capital. That’s because there are no transaction fees and no minimum balances. That’s nice because you’ll be able to get started no matter how little money you have available. Also, because there are no transaction fees, you won’t be at a disadvantage for starting out with a small account. It’s pretty easy to open an account, transfer money and invest. The way they set things up will save you a ton of time. Basically, when you open your account, you’ll answer a handful of questions and based on your answers, Betterment will suggest how you should invest your money. That’s also handy if you’re a beginner. Last, Betterment has a customer support line as well and that they are there to answer questions on the weekends too. Friendly. 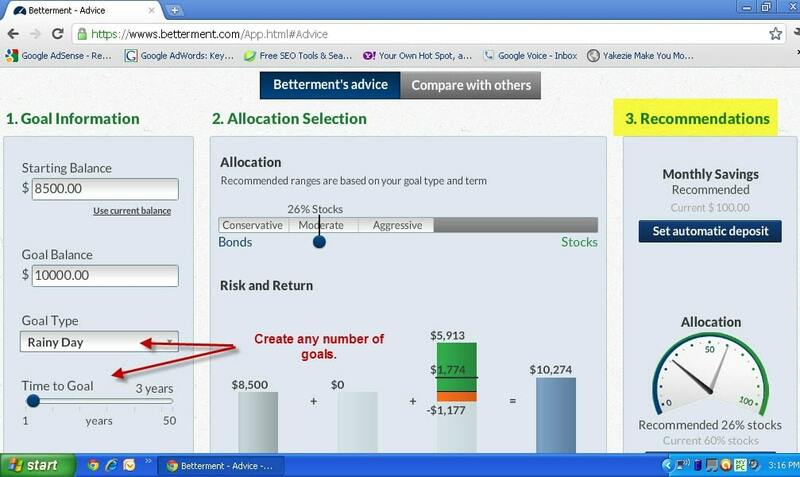 When you open your Betterment account , you’ll determine the asset allocation of your fund by answering a few questions. Let’s say for example that you determine that your asset allocation should consist of 50% equity and 50% fixed income. Once you set that allocation, the rest is done for you. Betterment will select the funds that best match your goals and they will invest the money accordingly. Who should not use Betterment? Risk – My experience tells me that people may think they know how much risk they are willing to take but they may not really know. It’s almost like a patient self-diagnosing her own health. Remember Bob Marley the king of Reggae? He thought he hurt his toe and treated himself accordingly. Unfortunately, he made the wrong diagnosis. Bob actually had cancer in his toe and because he ignored the real problem for too long, it killed him. My experience tells me that a quick questionnaire is simply insufficient when it comes to really finding out what investors are comfortable with. It requires a conversation. And it goes deeper. Just because you are comfortable with a certain level of risk doesn’t mean that is the right allocation for you. I might be comfortable with all my money in the market but it doesn’t mean that’s the best allocation for my circumstances. Again, for beginners, this isn’t all that important because the alternative for many people just starting out is not to invest at all. Betterment is quick, easy and inexpensive so it’s far better than doing nothing. Allocation – My second concern is the static asset allocation. I am not a fan of “set it and forget it” even though it has its benefits. For example, the allocation calls for a total of 35% of the equity portfolio being invested in either emerging markets or Euro Pacific funds. I am not a fan of either one of these markets right now. This is not an indictment of Betterment per se but my continued beef with asset allocation funds. I believe it makes more sense to be proactive. Take the market’s temperature and invest accordingly. Planning – As I mentioned above, financial planning is the work that makes a huge difference in the lives of investors. This is much more important in my opinion than investing yet because there is no profit in that work, these firms ignore it – and neglect to tell you how important it is. Again, once your account exceeds $50,000, I’d look for alternatives. (Note – Since this post was published, Betterment changed some of the programs. If you invest more than $100,000, you have a few more investment options and you have access to the company’s CEO to consult with. While nice, I stand by my concerns above. If you have more than $50,000 it would make sense to look for other alternatives. Betterment accounts are covered by SIPC. That means your accounts are protected up to $500,000 against losses that result form fraud or mismanagement. That includes if Betterment goes bye bye. This does not however protect you from market risk. You don’t know how to invest. You don’t have the time to set it up. You don’t have the time to rebalance. Your account is small and the transaction fees are prohibitive. Betterment is not a perfect solution for everyone and you could certainly lose money using this service just like you could investing on your own. But if you have long-term goals and you aren’t invest for whatever reason, I believe you should consider Betterment and check them out further. *Disclaimer – I am an affiliate of Betterment. If you open an account I will be compensated. Make sure to consult your financial advisor (if you have one) before investing. I have been using Betterment for a little while. I am pretty much a novice in investing but want to give it a shot without losing my shirt. However, I don’t really see how Betterment can aid you in building wealth unless you dump a large amount of money into it. The only way I can see to make it money is when you actually turn some profit, cash out and then put it back otherwise, it appears you just running on a treadmill. I see the “Money I invested” and the “Money you earned” since the Money invested is always ONLY the money I put in and the “Money I earned” is pretty much just virtual, I see only benefiting if that “virtual” money actually becomes yours and then you put it in as “Money I invested”. I maybe be wrong but other then that I really don’t see how it is doing anything for my money except serving as a savings account where you have to take the money out when it had some capital gains. Your account statements should show you how much you invested and what the account is worth. That would include all gains unless you withdraw money. Betterment just offloads the investment process for you. Does that help? I am very interested in investing with Betterment, but I would really like to know their profatiblity and their revenue to get a better confidence. cause after all .. are they really profitable? Have you asked them for a track record? What is your suggestion if investment is more than 50,000, is there an alternate to betterment, I am not interested in etrade, Merryl lynch type alternatives where they play with your money for commissions and you do not make much. Hunter, I believe at that level, you might want to consider talking to a financial advisor. Have you done this? Would you prefer to do this on your own? I found your site while searching for reviews for Betterment. Since there are no fees to withdraw money, wouldn’t this make a great higher interest emergency fund than a traditional savings account? I’m considering putting a large portion of my 6 month fund in an account with Betterment and setting the slider all the way to Conservative to get at least some return on this money that is otherwise not really earning interest. Is there a flaw in this logic or does this seem reasonable? b. if not, is it 100% bonds? c. if bonds, what are the durations? Hey Neal, sounds like a great beginners tool, investing with training wheels. But, where does one go from there? It’s above the “What you’ve invested” text. YES…thanks… Gotcha. That is the gross return since inception. I would prefer they use annualized of course. You got a 34.9% return with an allocation of 60% stocks & 40% bonds since 2009? You got in when irrational emotional people were pulling out? I am using Betterment as a savings vehicle for now and using the $25 sing-up bonus as a buffer. So far, the stock investment is positive. I hope it continues to do so… If it doesn’t, its nice to know it is easy to withdraw and you don’t have to deal with asking prices. I don’t see any mention of a 34.9% return. I believe this is the allocation and not the return you are referring to.